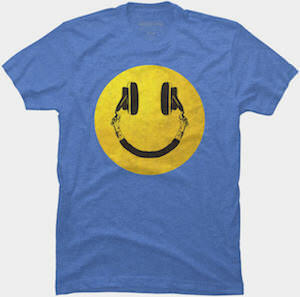 Now you can wear this Music Smiley t-shirt that will bring smiles to peoples faces because it looks so amazing. 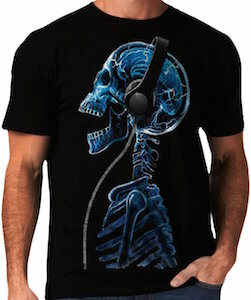 This t-shirt shows a smiley face but it is not just a normal happy looking smiley face, it is one that shows a face but it is made from a pair of headphones. So if music makes you happy then this is the t-shirt for you as it clearly shows how happy you are. You can get this fun shirt in style for men and women and it is available in 16 different colors and in sizes Small – 5XL. 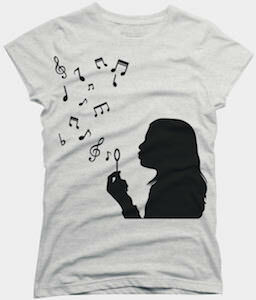 If you like to blow bubbles and music then you should check out this fun musical bubbles t-shirt. On the t-shirt you can see a silhouette of a girl that is trying to blow bubbles like we all like to do but this time not soap bubble appear instead it shows musical notes and that makes this a fun musical t-shirt. 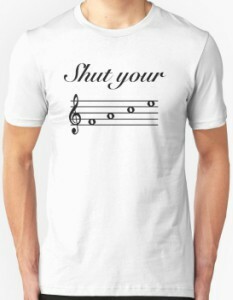 And this musical t-shirt is available in styles for men, women, and kids and it is available in many colors too so that you can get the perfect musical bubbles t-shirt. 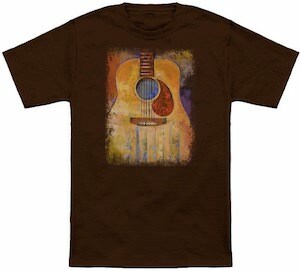 If you like guitar music then you have to check out this acoustic guitar t-shirt. On the t-shirt, you can see a square with a guitar as it is a painting on the t-shirt and it really looks amazing. You can get this 100% cotton t-shirt in many colors to make the guitar look amazing on a shirt that is just perfect for you. You can get the guitar t-shirt in styles for both men and women and it comes in sizes Small – 6XL. Get ready for your music and wear a cool guitar on the shirt you wear when you are playing or enjoying guitar music. The classic voice and songs of Lionel Richie have captured the hearts of many, why not remember him with a classic t-shirt. 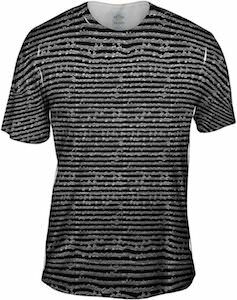 This is a t-shirt that features a white line silhouette image of Lionel Richie with his classic afro hair and a horizontal striped sweater along with the phrase “Hello. Is it me your looking for?” which is a line from his famous classic song Hello. It is available in a large selection of sizes that will range from Small to 3XL and you can choose from many different colors of shirts. With a 100% cotton you will be getting a soft and durable shirt that will be great for all occasions. 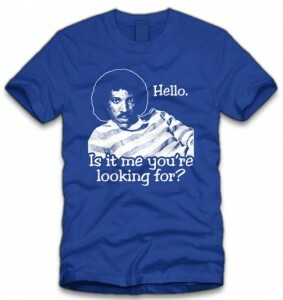 Get the Lionel Richie Hello Is It Me Your Looking For T-Shirt. What? I can’t hear you! Turn down that music! No way. Keep the music turned up with this tank top just for you. This sleeveless t-shirt is black with “I Like My Music Loud” written across the chest with white blocks surrounding the “I like my music” and “loud” is written in red. The sizes are listed in junior sizes from Small to 2 Extra Large which will fit ladies that like a slimmer fit. It is made from a cotton blend and goes great with a pair of jeans or some flashy tights. 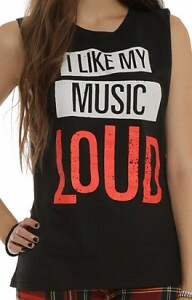 Turn it up to 10 and show off your moves in your I Like My Music Loud Tank Top. “Come Together”, “Here Comes the Sun”, and “Octopus Garden”. It’s 1969 in the United Kingdom and the 11th Beatles album has been released. To this day the Abbey Road album is still the Beatles’ best selling album. 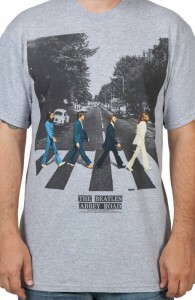 This grey short sleeve t-shirt shows the cover of the Beatles’ album Abby Road. John, Ringo, George and Paul are shown crossing the road outside of the Abbey Road Studios. It is black and white except for the 4 boys from Liverpool, England. It runs from size Small to 2 Extra Large and is suitable for both men and women. Wear a piece of music history with your Abbey Road Beatles T-Shirt.